If you want to transfer music from iPod to computer Windows 10 for back up or you just want to listen to the music on your computer, you can take advantage of iTunes or a third-party program to help you. Actually, I am really fond of listen to music on computer when I am working on my computer Windows 10, and here I would like to share with you how to transfer music from iPod to computer Windows 10. Let’s check out the solutions in the following guidance. 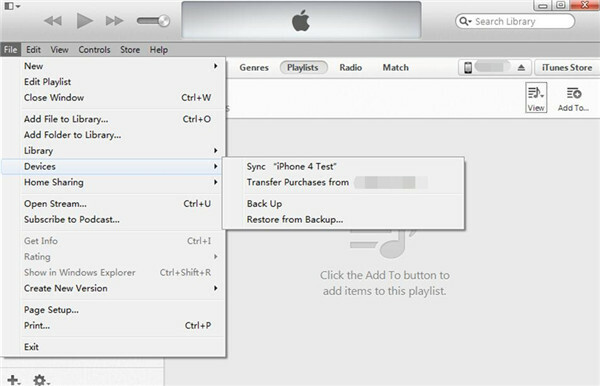 If you want to transfer music from iPod to iTunes library, click: 3 Ways to Transfer Music from iPod to iTunes Library. iTunes is really a good choice for you to copy music from iPod to Windows 10, and this is a simple way for transferring the purchased music. Let’s check out the detailed steps. 1. Connect your iPod into computer Windows 10 with USB cable and launch the latest iTunes on your computer Windows 10. 2. Head to the iTunes Store and select “Authorize This Computer”. Then fill in the Apple ID of yourself to buy the music. 3. Click on “File > Devices > Transfer Purchases from ‘device name’ ” in the panel of iTunes. 4. 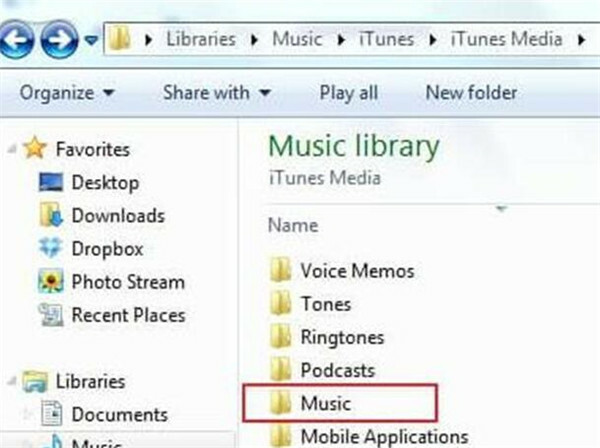 Find the iTunes media folder on your computer Windows 10. By default, the exported music will be saved at C:Users/Administrator/Music/iTunes/iTunes Media. Then you can enjoy the music transferred from your iPod on computer Windows 10. This solution is quite easy, but you can only transfer the purcahsed music with this method. If you want to transfer music from iPod to computer Windows 10 thoroughly (ie. to transfer all music), you can try the following two methods. 1. Launch Dropbox on your iPod, and then log in the account you own. If you don’t have a Dropbox account, you can click on “I don’t have an account” to create a new one. 2. Copy the music in your iPod to the folder of Dropbox on your iPod. 3. Launch Dropbox on your PC Windows 10 and tap the folder of Dropbox. 4. 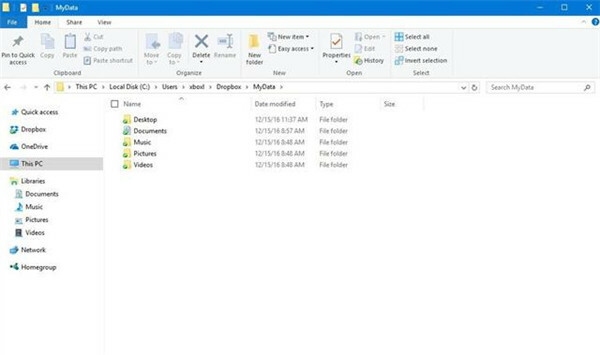 Click the music file names and copy them to your PC Windows 10. Finally, you can transfer music from iPod to computer Windows 10 with Dropbox. You can also take advantage of this program to transfer other files, like apps, movies and so on. 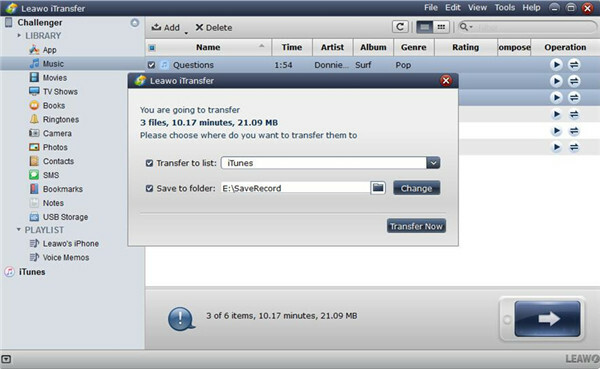 Leawo iTransfer is multifunctional transfer software for iOS devices, and it is helpful for transferring data among iOS devices, iTunes and PCs. You can extract music from iPod directly and send them to computer Windows 10 with Leawo iTransfer. 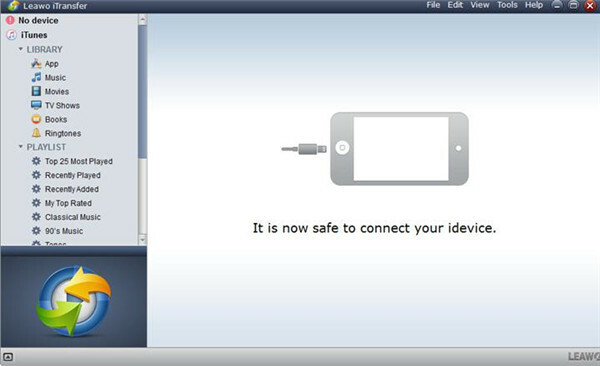 It can also help users to add files to their iOS devices without the sync of iTunes. The following guidance will show you how to transfer music from iPod to computer Windows 10 without iTunes. Launch Leawo iTransfer and connect your iPod to computer Windows 10 with matched USB cable. Tap the name of your iPod and select “Challenger > Library > Music” panel in the left interface. Select the music you want to transfer in the right interface and tick the empty square beside the “Name” list of songs and click the “Transfer” button at the right bottom. A panel will pop up, and you need to set the output folder of the exported music. Check “Save to Folder” in the dialog and tap “Change” to choose a folder in your PC Windows 10. Tap “Transfer Now” to begin to transfer music from iPod to PC Windows 10. Wait until the transfer process is over. With this guidance, you will finally transfer music from iPod to computer Windows 10 directly. This is really a great way to solve the issue of “how to transfer music from iPod to computer Windows 10”. I really recommend you to use iTransfer, for it can be used to transfer up to 14 kinds of files among different devices, such iOS devices, computers and iTunes. Have a try and you will fall in love with this wonderful tool.